City played Thurrock tonight. An Essex team residing deep in the depths of the Blue Square South. 13 minutes to go, City are 2-0 up and cruising. Then Thurrock score. 2-1. 5 seconds to go (yes, literally). Still 2-1. Thurrock down to 10 men. Then it happened… the moment of madness. The April Fools joke… 2-2. Game over. Rubbish. When Greenwich Mean Time became British Summer Time at the weekend, everybody lost an hour. Everybody except me, who lost two. Saturday night I was very tired, so had a relatively early night of 23:00 (GMT). Knowing the clocks were going forward that night, and assuming my iPhone wouldn’t make the change automatically, I moved the time forward an hour to 00:00 (BST). Everything was fine until this morning. I normally get up for work at 07:45. My alarm rang on time as normal. I was exceptionally tired, but put this down to losing an hour and the general Monday morning feeling. I got washed, dressed, made sandwiches for work and had breakfast. I then turned on the radio, only for Chris Moyles to announce it was 06:55! Then it clicked. On Saturday, when I moved my clock forward an hour from 23:00 to 00:00, I forgot to also change the day. Therefore I was moving backwards 23 hours to Saturday at 00:00, not Sunday at 00:00. Besides the phone displaying the wrong day, this would not normally be a problem. However, in the night (Monday morning), my phone thought it was Sunday and moved the time forward an additional hour (like it should for daylight saving). So there I was, out of bed, all ready for work at a time that I would never normally surface from my slumber. Did I go into work an hour early? Did I make use of the time to do some things around the flat? No – I went back to bed for an hour. This just goes to show, with people like me making stupid mistakes, this whole daylight saving rubbish should be abolished. The system was only developed so farmers can work on the land in the light and kids don’t get run over on the way to school (probably). Nowadays, we’re not all farmers and all kids get driven to school in a Chelsea Tractor, so it doesn’t matter how dark it is! Yesterday I went with Claire to Kent to watch Bath City play Bromley. Bromley play at Hayes Lane, which is a beautiful, traditional football ground and my favourite in the Blue Square South. It really was a game of two halves. City battered Bromley for the first 45 minutes. I know it’s an old cliché, but had it been a boxing match, they would have stopped the game. Unfortunately, City failed to capitalise on the dominance, and despite hitting the cross bar and having a ball cleared off the line, went into the dressing room at half time with the scores tied at 0-0. I had a bad feeling City would live to regret the missed chances. My fears were confirmed, when early into the second half, Bromley scored. Luckily City equalised minutes afterwards. The game ended 1-1, despite heavy pressure from Bromley in the closing stages. While both sides were happy they didn’t lose, I think they both felt that they missed a chance to win – Bath especially. Here’s some photos from the picturesque ground, including a lovely cat that happened to be at there. There’s only one Jenson Button! 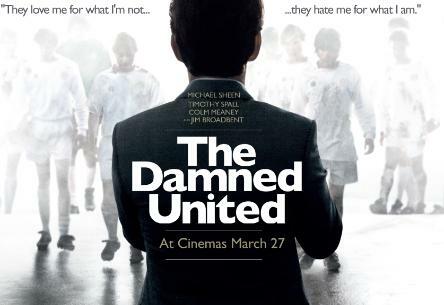 As a Leeds fan, I thought it was my duty to go and watch the Brian Clough/Leeds United film, The Damned United. So, after work, I went straight to town for a late afternoon screening of the film. After sitting through half an hour of adverts – most of them horrible, involving bar tenders with split personalities telling you not to drink and drive; people carrying the names of STDs on their underwear; and a man who keeps seeing a run over boy wherever he goes (will someone give that kid a proper burial? ), the film began. The film focuses on Brian Clough’s infamous 44 day stint at Leeds United. Clough had just won the league with Derby and, despite a hatred for the club, joined Leeds, who, at the time, were the biggest club in England – as large as Manchester United are today (how the mighty have fallen). The film is set in 1974 – before my time, but as a football and Leeds fan, I have been made more than aware of the infamous events of those 44 days. I therefore was very excited to see the film. To cut a long (or 44 day) story short, Clough didn’t do very well at Leeds – a lot of this down to his own, personal mistakes – strange for a man who would go on to have such a successful career in European football. – Don Revie, who left Leeds to manage England (and failed) should have stayed to build on his success, allowing Clough to get the international job. – I loved the part in 7-a-side where Johnny Giles went 2-footed, studs up, on Clough – hahaha! I am pleased to say Brian Clough, Don Revie, Leeds United and Derby County, all come out of the film in a very positive light, despite some of Clough’s relatives reacting angrily to the plotline. I really liked the film. You don’t have to be a Leeds or Derby fan to enjoy it – you don’t really have to follow football, although if you hate the sport, it probably is best to avoid.